This large shark is often confused with several other sharks because of its fin sizes and placements, and dark grey on top and white underneath coloring. They are abundantly present around oceanic islands. Younger sharks usually eat bottom-dwelling fish, but as they grow, they work their way up to elasmobranch such as rays and smaller sharks (and even fellow Galapagos sharks), and becomes increasingly indiscriminate. They have been observed eating or attacking seals, sea lions, marine iguanas, and garbage. English language common names include Galapagos shark, grey reef whaler, and mackerel shark. 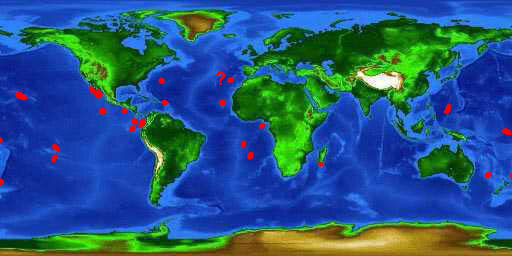 Common names in other languages include cação (Portuguese), cazón (Spanish), Galapagoshaai (Afrikaans), jaqueta (Spanish), jaquetón (Spanish), ma’o (Rapa), malie (Samoan), manô (Hawaiian), requin de Galapagos (French), tiburón (Spanish), tiburón de Galapagos (Spanish), tollo (Spanish), tollo-cazón (Spanish), and tubarão-dos-Galápagos (Portuguese). Due to its somewhat remote habitat and patchy distribution, the Galapagos shark is of little economic importance. There is little information available regarding utilization of this shark, however it has flesh of excellent quality for human consumption. According to the International Shark Attack File, the Galapagos shark has been responsible for one fatal attack on a swimmer in the Virgin Islands. In locations where this shark is abundant, they often are attracted to divers, sometimes even becoming a hindrance. When divers took aggressive actions, these sharks were not deterred but instead became more excited. Prior to attack, the Galapagos shark has been reported to display threat behaviors including arching of the back, raising the head, and lowering the caudal and pectoral fins while swimming in a twisted, rolling motion. This species is considered potentially dangerous and may attack if a food source is present such as during spearfishing activities. If there are large numbers of Galapagos sharks present, it would be wise to limit one’s activities in the water. The Galapagos shark is currently considered “Near Threatened” by the World Conservation Union (IUCN). A taxon is assessed as “Near Threatened” when it has been evaluated against the criteria but does not qualify for Critically Endangered, Endangered or Vulnerable now, but is close to qualifying for or is likely to qualify for a threatened category in the near future. > Check the status of the Galapagos shark at the IUCN website. The IUCN is a global union of states, governmental agencies, and non-governmental organizations in a partnership that assesses the conservation status of species. In Australia and Ocean (western Pacific Ocean), the Galapagos shark is considered “Data Deficient” due to a lack of information on populations in this region. However, there is a marine reserve that encompasses this species’ range off Lord Howe Island (AUS) and the Kermadec Islands (New Zealand) where it is not considered to be under threat. 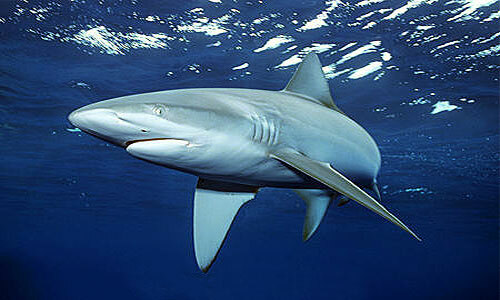 The Galapagos shark is circumtropical in distribution with a preference for waters surrounding oceanic islands. In the regions of the Atlantic Ocean, this includes St. Paul’s Rocks, Ascension, Cape Verde, Saint Helena, Sao Thome, Bermuda, and the Virgin Islands. and in the western Indian Ocean it is found at Walter’s Shoal south of Madagascar. Distribution in the tropical regions of the Pacific Ocean includes Lord Howe Island, Tuamoto Archipelago, Middleton and Elizabeth Reefs, Hawaii, Revillagigedo, Clipperton, Cocos, and Galapagos. Distribution limits are not well defined due to confusion with similar species of sharks. This shark is quite abundant in waters around oceanic islands, found close inshore as well as occasionally reported offshore in waters over continental and insular shelves to depths of 591 feet (180 m). It has a preference for clear tropical waters with strong currents over coral or rocky bottom habitats. 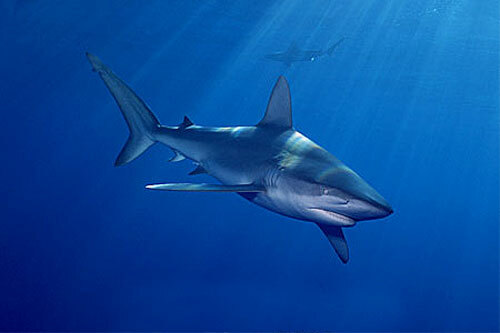 Although it is considered a coastal species, the Galapagos shark has been reported to cross open waters between islands. Juveniles are limited to waters shallower than 82 feet (25 m), which act as nursery grounds and help avoid cannibalism by their own parents. This shark often swims just above the bottom substrate, forming loose aggregations. 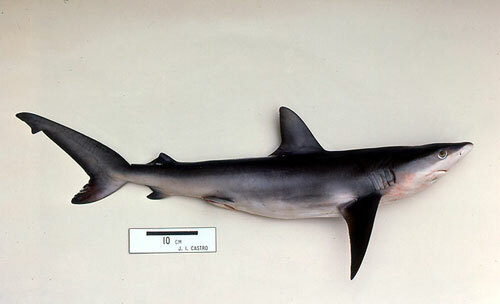 This is a large shark with a slender, fusiform body and low inter-dorsal ridge between the first and second dorsal fins. The tall and nearly straight first dorsal fin originates over the posterior third of the pectoral fin inner margin. The long pelvic fins are straight, each with a pointed tip. The snout of the Galapagos shark is broadly rounded. 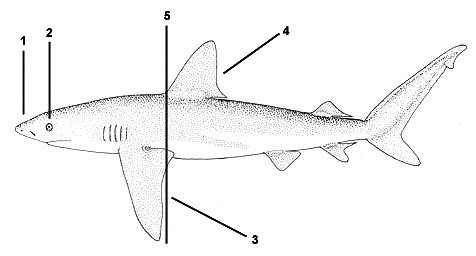 Resembling the grey reef shark (C. amblyrhynchos), the Galapagos shark can be distinguished with a more slender body and a slightly rounded tip on the first dorsal fin. 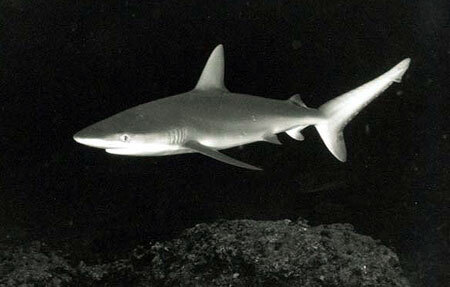 The Galapagos shark very closely resembles the dusky shark (C. obscurus). The Galapagos shark has a much more erect first dorsal fin and larger teeth than the dusky shark, however this can be difficult without direct comparison of two specimens. The easiest method to distinguish these two species is by the number of precaudal vertebrae – there are 103-109 in the Galapagos shark and 86-97 in the dusky shark. To determine the number of vertebrae, the backbone must be exposed from the back of the skull to the base of the tail. 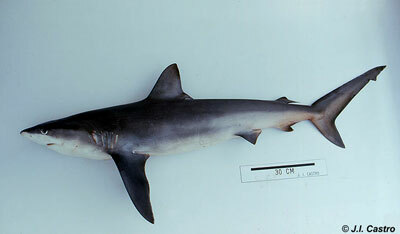 The Galapagos shark is brownish-gray upper body and white ventral surface with or without dusky markings on the fins. An inconspicuous white band can sometimes be seen on the flanks. The serrated upper teeth are relatively long and broadly triangular in shape. The very finely serrated lower teeth are symmetrical and erect. Typically there are 14 teeth on either side of the symphysis in each jaw with one tooth located at the symphysis. The Galapagos shark reaches a maximum length of 12.1 feet (3.7 m). Male individuals mature at lengths of 6.9-7.5 feet (2.1-2.3 m) while females mature at 7.2-8.2 feet (2.2-2.5 m) in length. Age of Galapagos sharks at first reproductive effort is approximately 10 years. Maximum known lifespan is approximately 24 years. This shark feeds primarily on bottom-dwelling fishes as well as on squid and octopus. These fish include eels, flatheads, groupers, flatfish, and triggerfish. As Galapagos sharks reach large sizes, they also feed on other elasmobranchs. In the Galapagos Islands off the coast of Ecuador, it has been observed preying on sea lions and marine iguanas. The Galapagos shark displays threat gestures to warn competitors in the search for food. Galapagos sharks are “viviparous”, or livebearing, with embryos nourished by a yolk sac placenta during gestation. Mating and birth occurs early in the year within Hawaiian waters. Female individuals often have mating scars from males biting the gills, fins, and body. After gestation during which the embryos develop inside the mother, live birth results in a litter size of 4-16 pups. Each pup measures 24-31 inches (60-80 cm) in length. The pups stay in shallow water nursery areas to avoid predation and cannibalism from members of their own species, eventually moving out to deeper waters as they mature. Large sharks are potential predators of the Galapagos shark. Cannibalism is also reported within this species. Originally the Galapagos shark was named Carcharinus galapagensis Snodgrass and Heller 1905, followed by a name change to Carcharias galapagensis Snodgrass and Heller 1905. 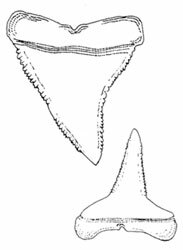 Later that same year, this shark received its currently valid name of Carcharhinus galapagensis (Snodgrass and Heller, 1905). The genus name Carcharhinus is derived from the Greek “karcharos” = sharpen and “rhinos” = nose. The species name galapagensis is derived from the location, Galapagos Islands Ecuador, where the described specimens were caught in 1905.